Got rid of a dead link to the Sukhoi Design Bureau's Su-37 Terminator, otherwise known in the West by its NATO designation--the Super Flanker. Put a new link in its place. Also updated a link to the "Iron Tadpole,", the Grumman A-6 Intruder. Added a new picture of an F-14 breaking the sound barrier. Added information about the aircraft involved in the mid-air collision of a U.S. Navy EP-3 Aries II and a Chinese F-8 fighter. The Chinese government has subsequently seized the EP-3 and has illegally invaded U.S. sovereign territory (i.e., the EP-3) and removed sensitive eavesdropping equipment from the plane in spite of U.S. protests. Get the latest news at CNN.com. Added two Air Force TV commercials featuring the F-117A: "Fuel" and "Lullaby." Added a dramatic waveoff video of an F-14 missing a carrier approach. Added some Sonic Boom photos from SkyFlash, courtesy of E.J. van Koningsveld. Added a new aircraft to the Attack Planes section: The EA-6B Prowler. Added a page from Alexandre's site about an upgraded version of the MiG-25 Foxbat, the MiG-31 Foxhound. Updated some dead links. Added a new aircraft, the MiG-17 Fresco. Added a Quick Index to all aircraft categories on Landen's Airplane Page. Thanks to all of our visitors! I will be adding a feedback form soon, but until then, if you have any suggestions, please email me. Added three new photos of F-14s breaking the sound barrier. Added a new link to the "Neat Stuff" section: Air&Space Smithsonian Magazine. Updated the link to Don Pyeatt's B-36 Peacemaker website. Also added a new link to www.B-36.net. Created a Dutch version of Landen's Airplane Page. Why? Because although I am American, Nederland has had a special place in my heart ever since I served an LDS mission there in 1985-86. Also added a link to Jane's Air Forces. Added a link to Landen's X-33 Page. Added a new plane to the "Attack Planes" category: The North American A-5 Vigilante. Also added a link to a good site about the P-51 Mustang, MustangsMustangs.com. Checked all links, deleted dead links and updated some others. Posted a link to an interesting website, documenting a little-known fact: The F-86, not the X-1, was the first aircraft to break the sound barrier, with ace test pilot George Welch at the controls. Of course, the difference was that the X-1 did it in level flight, whereas the XF-86 did it in a dive. Still, the F-86 did it first! Also added a video of an F-14 breaking the sound barrier. Added a new aircraft: The General Dynamics EF-111A Raven. Also added a link to video of the Lockheed Martin X-35 First Flight. Added a new section called "Sonic Boom Photos" showing--you guessed it--aircraft breaking the sound barrier. Added a link to information about the F-8U-3 Super Crusader. Be sure to read the bottom paragraph about the top speed of this plane. I wonder why it lost out in the fly-off against the F-4? Perhaps because it had only one engine, while the F-4 had two. Also added an audio (.au, 295K) file of the Phantom howl. Anyone who's ever worked with the F-4 Phantom will recognize it immediately. Also added a link to a page detailing the specs and performance of the Republic Aviation Corporation F-105 Thunderchief. ALSO... added a cool photo of an F-14 doing an aggressive flyby of the USS America. Here is the story behind the photo, as told by the man who was in the pilot's seat. Updated the link the the Eurofighter website. It has undergone a "refit" and is very slick. Be sure to check out the photo library. Added a new video (I think it's from Top Gun of an F-14 dogfight with what is supposed to be a MiG, but which looks suspiciously like a Northrop F-5. Judge for yourself. Added a link to an Air Force TV ad featuring the F-22 Raptor. Also added a link to the official Thunderbirds website, and an excellent F-15 website called f-15eagle.com. Added a link to the official site of the premier F/A-18 aerobatic demonstration team, the Blue Angels. Added links to video of the Boeing X-32A First Flight on September 18, 2000. There are links to 28.8k, 56k, and 200k connections. Also created a new section called "World War II Warbirds" instead of the old "Pursuit Planes." One other change--I removed the Northrop F-20 Tigershark from the "Fighter Planes" section to the "Planes That Didn't Make It" section. An astute visitor pointed out that egregious faux pas. Whoops! Made some upgrades to the XF-100A Firehawk. These are not so much "upgrades" as newer information that has become available regarding the capabilities of this ultimate fighter aircraft. Checked ALL links, updating many and deleting a few dead ones. Also added a new link to the Daussalt Jaguar. All the Daussault links are in French right now. They are still working on the English versions. Updated some cargo aircraft links to The Aviation Zone. It has undergone some major updates, so go over and check it out! Added a link to a new B-58 Hustler site, B-58 Hustler.com. Added a link to the third widebody tri-jet, the McDonnell Douglas DC-10. Added two new videos: the Sukhoi Su-37 "kulbit" and "kobra" maneuvers. They must been seen to be believed! 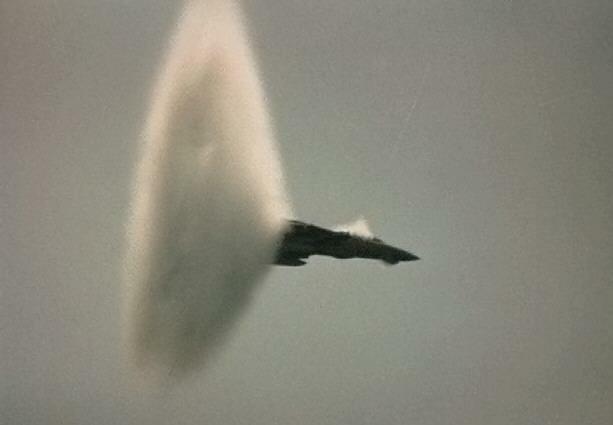 Linked to a photo of an F-4 Phantom breaking the sound barrier. The previous picture on my site was credited to the wrong photographer. Thanks to Mike Neely of The Aviation Zone for the correction. Added a link to the world's largest and most powerful bomber, the Russian-built Tupolev Tu-160 Blackjack. Note its intentional resemblance to the U.S.-built Rockwell B1-B Lancer. Added a couple of new F-86 links: Duncan's F-86 Sabre Page and The F-86 Sabre Pilots Association. Sabres rule! Added a link to Air Power International, an online military aviation journal. Added video links of the A-6 Intruder takeoff and landing. Aviation Week Online is now AviationNow. Added new link to the official U.S. Navy F/A-18 page, "Hornet Hyperlink."